There are times you might have to stare down a massive wave of tokens and you simply can't block all of them. There's enough to easily deal 20 or more damage to your dome and you need an answer. Unlike my other posts in this series, I won't be explaining the choices since the cards themselves seem pretty self explanatory. Instead I'll just list more examples than usual. Board sweep fixes a lot of problems. In fact it fixes most problems. Why deal with tokens when you can just carpet bomb the area? Wrath of God, Day of Judgment, Austere Command, Phyrexian Rebirth, Martial Coup, Pyroclasm, Slagstorm, Volcanic Fallout, Flamebreak, Infest, Mutilate, Decree of Pain, Damnation, Life's Finale, Black Sun's Zenith, Windstorm, Corrosive Gale, Hurricane, etc. 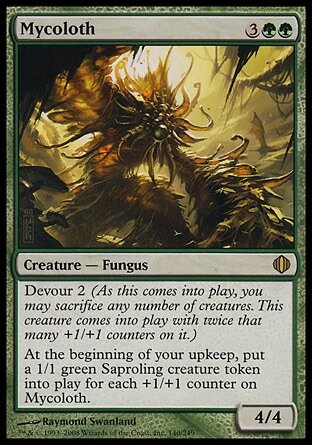 Static effects are capable of keeping tokens off the field indefinitely. These cards keep the field clear of annoying pests better than a pool of acid or your mother's horrendous singing voice. Elesh Norn, Grand Cenobite, Ghostly Prison, Norn's Annex, Windborn Muse, Night of Souls' Betrayal, Engineered Plague, Ascendant Evincar, Screams from Within, Leyline of Singularity, Stormtide Leviathan, Cumber Stone, etc. Some cards punish opponents for having, casting, or attacking with too many creatures. Warning: casting these may bring you a bit closer to the dark side. Blood Seeker, Massacure Wurm, Hissing Miasma, Netherborn Phalanx, Spreading Plague, No Mercy, Dread, Circle of Flame, Suture Priest, Lightmine Field, Michiko Konda, Truth Seeker, Dissipation Field, Powerstone Minefield, Raking Canopy, Retaliator Griffon, Farsight Mask, etc. Bouncing back an entire wave of tokens to the opponent's hand means they lose all of them for good. Much like sinking the Titanic, these tokens won't be able to paint anyone like one of their French girls. Echoing Truth, Evacuation, Inundate, Hurkyl's Recall, Wash Out, Soulquake, Wouldpurge, etc. If your opponent is only using an army of tokens as annoying blockers then foil their plans with these spells that tap them out and leave them defenseless. Thoughtweft Gambit, Naya Charm, Sleep, Aether Shockwave, Aboshan, Cephalid Emporer, etc. Maybe your opponent attempts to setup a single massive strike with an Overrun or similar effect? Why not use a ninja smoke ball such as Fog, Moment's Peace, Tangle, Blunt the Assault, Holy Day, Kami of False Hope, Darkness, Batwing Brume, etc. Echoing Truth was already mentioned but Echoing Decay, Echoing Ruin, and Maelstrom Pulse can work just as well. Remember, when dealing with tokens: just don't. This is Kylak signing out and reminding you to always have the higher ground against their token army.